Shamus Award–winner John Straley returns to his critically acclaimed Cecil Younger detective series, set in Sitka, Alaska, a land of perfect beauty and not-so-perfect locals. John Straley was born in Redwood City, California. He received a BA in English from the University of Washington, but settled in Sitka, Alaska, with his wife, Jan, a prominent whale biologist. John worked for thirty years as a criminal defense investigator, and many of the characters in his books were inspired by his work. Now retired, he lives with his wife in a bright green house on the beach and writes in his weathertight office overlooking Old Sitka Rocks. The former Writer Laureate of Alaska, he is the author of ten novels, including Cold Storage, Alaska and the Shamus Award–winner The Woman Who Married a Bear, the first Cecil Younger investigation. "Happily, both Straley and Younger are back, and they are in fine form. Not only that, but Soho Press has republished the whole series with striking new matching covers." "It started like a heavy-footed drag racer hitting the gas pedal before the light turned green and it was a Gonzo joy ride from there . . . Buy it, shut off your devices, call in sick, and get a babysitter for however long it will take you to read Straley's latest page-turner, Baby's First Felony." "Straley writes with a poet's ear and a quirky, Zen sense of humor . . . The story is at times brutally violent, but never gratuitous, and is as entertaining as it is moving and honest." "Most welcome . . . It’s good to have Cecil back." "What a wild wild ride. Straley grabs you by the throat and doesn’t let go. You think left and he goes right. You think up and he goes down. Cecil Younger is a continuously great but flawed and wobbly investigating hero." "Masterfully balances semi-comic crime-caper elements with pitch-black criminal activities." "It has been 17 years since the last Cecil Younger novel from John Straley. 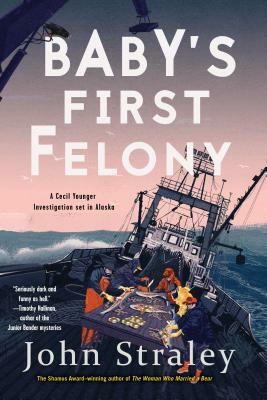 That’s a long hiatus, to be sure, but Baby’s First Felony proves more than worth the wait, as Alaska’s erstwhile writer laureate dusts off his suspense fiction chops to craft the finest installment of the series thus far." "Straley humanizes slapstick mayhem in his exceptional seventh Cecil Younger mystery . . . Hilarious." "After 17 years, Straley checks back in with Cecil Younger and the citizens of Sitka, Alaska, and finds them as wacky as ever and even more murderous." "John Straley is an Alaskan treasure. Baby’s First Felony is a page-turning, darkly hilarious murder mystery turned upside down. With the help of a crazy cast of characters, investigator Cecil Younger is taking on the criminal underbelly of an Alaska seaside town, even as he faces the equally terrifying trials of parenting a teenager. As always, Straley has brought his unflinching eye, compassionate heart and lyrical voice to the story. Northern noir at its best." "A new book by John is always a cause for celebration here in Southeast Alaska, where he gets our home so right on so many levels, from the rain and the ravens on the telephone lines to the crystal mountain sunrises. But the thing that John does, or one thing that he does better than anyone, is bring the world’s issues—the dark and dangerous and ugly—into this beautiful remote place way out on the outer coast of North America, and then allows characters like Cecil Younger—who, like so many Alaskans, is quirky, kind, smart, brave, and so crazy he is sane—to solve them. John writes with a poet’s heart, a comedian’s timing, the real-life experience of a criminal investigator, and the soul of a great storyteller. He breaks my heart and heals it again in every book. John’s writing is like a combination of James Lee Burke, Ken Kesey, and William Stafford. At the same time, he could be a genre unto himself." "Cecil Younger clutches his laid-back sense of humor like a life ring as he descends into the underworld of his genial Alaska fishing town. I love the way he wryly watches himself make every mistake in the manual for low-life klutzes he helped write—it’s what makes this romp on the dark side so much fun." "In this seventh book in a series, Cecil Younger, an investigator with Sitka, Alaska Public Defenders Office, finds himself on the other side of the law when he tries to find and free his 13-year-old kidnapped daughter. After he enlists the help of two former clients, one of whose last name 'Boomer' aptly describes his criminal specialty, the mayhem begins. This series and book are filled with warm and wacky characters. The title is reference to a basic primer the Public Defender is writing on what to do or not do if you are arrested, such as 'When talking on the jail phone, Pig Latin is not an unbreakable code.' I anxiously await the next book in this series to find out if and how Cecil gets beyond his legal problems and to meet up again with some sweet and funny characters."